Hey friends! So excited it's officially November now and people will no longer think I'm ALL the way crazy for posting about Christmas stuff. Although I won't be in today's post. Nope, today I'm going to be whipping up one of my absolute FAVORITE recipe's EVER. Anyway, as promised this recipe is easy & family friendly. 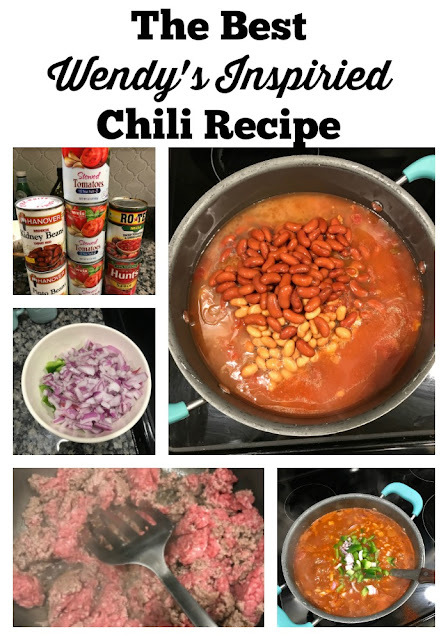 I'll be sharing my Chili recipe today! It's been tweaked a lot over the years as I've tried to figure out how to achieve that perfect yummy flavor with just enough kick. There is one thing I've recently started using that has taken this chili up to a whole different level. My inspiration for this recipe was how obsessed I was (And well, am.) with Wendy's Chili. Seriously, so good. While this recipe doesn't taste exactly like it, it's extremely close and I think you guys will enjoy it! I'll be making this over on Instagram tonight in stories to show you guys just how easy it is! But I'll share the recipe below if you're wanting to make it yourself. This recipe is SO easy because we're literally just throwing everything in a pot! Those are the best meals, let's be honest. Start by browning your ground beef in a medium sized pan. While beef is browning dice your onions and green peppers. Once beef is cooked thoroughly, drain excess liquid and transfer to a large pot. Place all ingredients in your large pot with beef, mixing each ingredient individually in with the beef. Top with onions and peppers. Add your spices- vinegar and chili seasoning, tasting as you go. Don't add any additional chili seasoning until it has at least simmered for 30-40 minutes, I think you'll find the flavors blend together the longer you let it cook. I made the mistake of thinking our chili needed more seasoning once or twice. It doesn't. OOPS. Let Cook on high for 30-40 minutes, you can also choose to simmer for as long as you'd like. Chili gets better with time! So that's it guys! Super easy, pair it with some grilled cheese and it's easily one of our favorite meals! Have you guys tried this yet? What did you think? I'd love to hear what you think. If you haven't tried it before, will you? What recipe would you guys like to see next week? Let me know! Happy Wednesday friends! You can shop all of my kitchen goodies below! Wendy's chili is the best!! Def gonna try this recipe!! And mexican Alfredo sounds amazing!!! Can't wait to try this recipe! :) Also would love to see your chicken noodle soup recipe! Love the chili recipe thank you and would like to try the Mexican Alfredo next. I made this tonight and we loved it! So so good. I wondered about draining the beans, but from your pictures I guessed that I didn’t need to and assume I was right. Thank you for sharing!